Turkish President Recep Tayyip Erdogan arrived in Tehran today and held talks with Iran’s Supreme Leader Ayatollah Ali Khamenei and President Hassan Rouhani. Erdogan’s visit comes amid strong criticism from Iranian politicians over his recent remarks on Iran’s role in Yemen. The Turkish president, who leads the country’s Justice and Development Party, a moderate Muslim Brotherhood Islamist grouping, had called on Iran to stop interfering in Yemen and warned Tehran that Turkey will not tolerate Iran’s attempts to dominate the region. 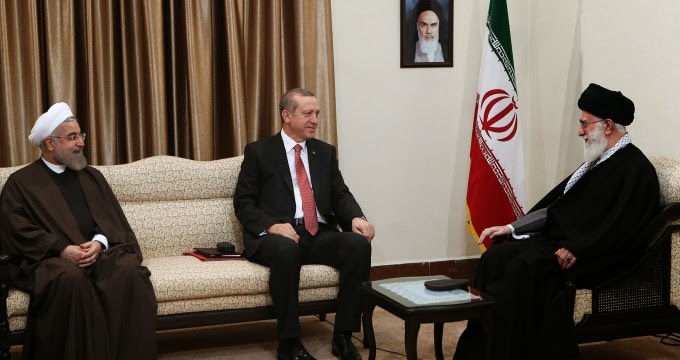 Today, Khamenei was quoted by Iranian news agencies as telling Erdogan in their meeting that Iran’s position toward Yemen is the halt of foreign intervention, and accused the U.S. and Israel of fostering differences among Muslim countries. Erdogan’s remarks on the subject during the meeting were not yet reported. publicly, he was saying that the reason that Turkey doesn't purchase more gas from iran is that the Iranians charge too much for the stuff.